This is such a random post, I know, but you can thank the slide show shuffle function that I have on my desktop for it. 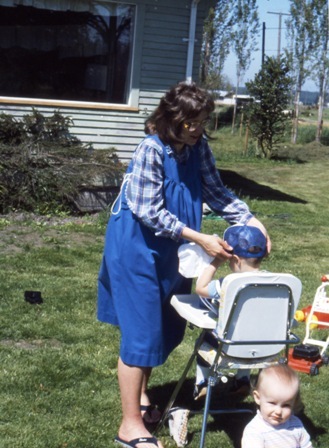 This picture came up, and instantly I was transported back in time to the era of the busy life with little ones. In this picture I have just finished giving Philip (almost 3 years old) a haircut, and little Laura (about 18 months old) is in the foreground. I’m pregnant with our fourth child. So . 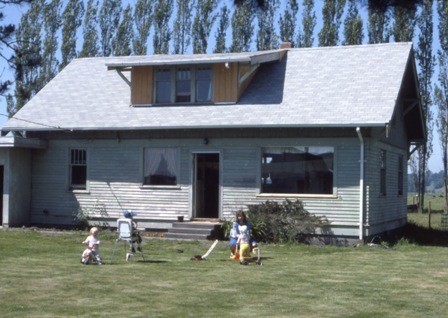 . . Way back then, we were renting an old farm house on Double Ditch Road in Lynden. The ditches were so deep that the spawning salmon swam up them! Big kids would go inner-tubing down the ditches in the summer. We only lived there three years, but the children have such happy memories of this old place that they asked to drive by there to see it for many years after we had moved. This picture is of the front of Double Ditch house, and you can see Laura’s twin, Sarah, as well. This entry was posted on Thursday, September 6th, 2007 at 8:27 am	and is filed under Favorite Photos, Fun Things, Memories. You can follow any responses to this entry through the RSS 2.0 feed. Both comments and pings are currently closed.